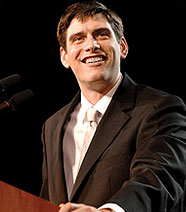 William Franklin Graham IV (Will) is the third generation of Grahams to proclaim the Gospel of Jesus Christ under the banner of the Billy Graham Evangelistic Association (BGEA). Will is the grandson of Billy Graham and the oldest son of Franklin Graham. In 2012, Will held multi-day events in five countries across three different continents, including the United States, Canada, India, Australia and Thailand. His 2013 schedule includes Celebrations in Kenya, Japan and Thailand. In 2012 Will was named vice president of the BGEA, overseeing Children and Youth Evangelism Training, which includes Dare to Be a Daniel (a youth evangelism course targeted at “tweens,” ages 9-14) and The Greatest Journey (a children’s discipleship curriculum); and the BGEA’s new Distance Learning Program, which uses the internet to teach people how to share their faith. Will also serves BGEA by overseeing operations and programming for the Billy Graham Training Center at The Cove in Asheville, N.C. The Cove offers multi-day seminars on a variety of Christian subjects and features nationally-recognized speakers.